Who should use Plexus XFactor Kids? Children under the age of 18 should stay with XFactor Kids. XFactor Kids can be taken at any time of the day. Children who have sensitive stomachs can take it with a meal. No artificial flavors, colors, sweeteners, or added preservatives. 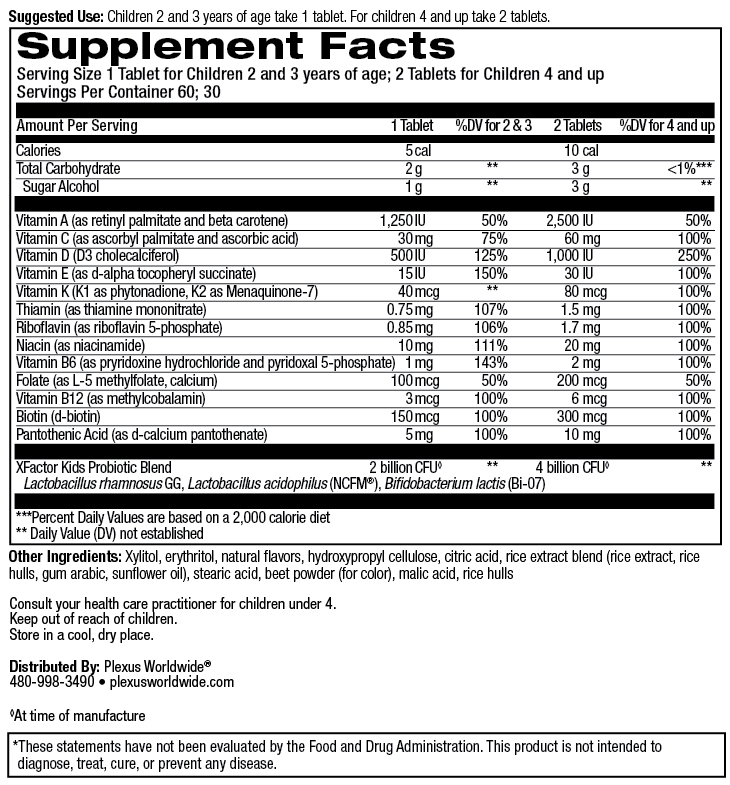 What is the difference between XFactor Chewables and XFactor Kids? XFactor Kids is a highly potent formula, with 13 vitamins combined with 3 probiotic strains for gut and immune health support. XFactor Chewables does not contain any vitamin A, vitamin K, natural vitamin E, or probiotics. * XFactor Kids is also Non-GMO. XFactor Chewables is no longer available. Can adults take XFactor Kids? While XFactor Kids was formulated with children in mind, it is safe for adults to take. Adults interested in a multivitamin should consider taking XFactor Plus. Is XFactor Kids allergen free or made in a facility with common allergens? Yes, XFactor Kids is free of common allergens (fish, dairy, eggs, peanuts, shellfish, tree nuts, soy, or wheat). If a major allergen is in the product, it is required by federal law to be listed on the label. XFactor Kids does not contain any of those allergens. However, XFactor Kids is manufactured in a plant that may contain those ingredients through raw materials that are in storage. What is "CFU" and is it important? CFU, or colony-forming units, is a term often seen in conjunction with probiotic supplements. It is a measurement of viable microbial cells that can replicate to form one visible colony. CFU count is as important as the clinical study it is tied to. XFactor Kids was formulated to deliver clinically demonstrated CFU counts at the time of expiration. What is the CFU count of XFactor Kids? XFactor Kids contains over 2 billion CFUper tablet at the time of manufacture, and delivers clinically tested levels of probiotics through the time of expiration. Why are probiotics important for children? The lot number is a 7 digit number found on the bottom of the XFactor Kids tub along with the expiration date of the product. Does XFactor Kids contain Iron? Why isn’t iron in the formula for XFactor Kids™? Most kids get plenty of iron in their daily diet (from meat, green leafy vegetables, broccoli, prunes, and other foods). Parents should consult a physician if they feel their child needs more iron. Why isn’t calcium in the formula for XFactor Kids™? Calcium should generally be ingested 2-3 times a day (the body can’t absorb it all in one sitting), which is too much to include in an XFactor Kids serving. Calcium needs also vary depending on individual diet. Parents should consult a physician if they feel their child needs more calcium. Does XFactor Kids contain black currant? No, XFactor Kids does not contain black currant. What probiotic strains are found in XFactor Kids? What are the natural flavors in XFactor Kids? XFactor Kid’s delicious tropical splash flavor include citrus fruit oil and extracts, along with vanilla. My child already takes a probiotic, can they also take XFactor Kids? Do I need to keep XFactor Kids refrigerated? We suggest storing XFactor Kids in a cool, dry environment.